What do you think about this forum organization? Well it'll be useful when we'll have more posts. Like ... a lot! where is the "haxorz" section?! Thx! I knew I forgot something. 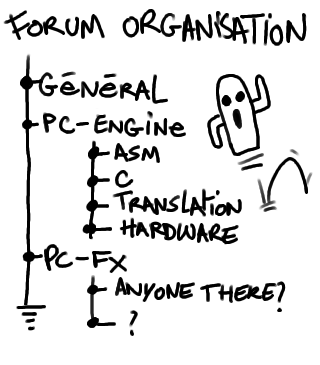 Do you think we'll give it its own section or make a hacking subsection for pce and pcfx? You can now attach files to your message. File size must be at most 256kB. You can only attach one file per message and 3 files per post. MooZ wrote: You can now attach files to your message. Just above the Save/Preview/Submit buttons, there's the option menu. And next to it, you have "Upload attachment" tab. MooZ wrote: Just above the Save/Preview/Submit buttons, there's the option menu. And next to it, you have "Upload attachment" tab. perhaps it's setup only for admins or something or perhaps im blind.